We asked our DSP’s (Direct Support Professionals) why they love their job. We knew being a DSP was a great job and expected a good response, but what we got was more than we imagined. Many many employees sent in a few reasons, personal stories, and some even sent in long narratives about why working with people with disabilities is so rewarding. We want to share some of their stories with you, exactly as they were submitted to us. So follow us as we take you on a journey of the joys of working as a DSP! I started as a DSP back in 1979 in Greencastle In. At the time I was surprised there was such a thing as a sheltered workshop and growing up had not known anyone with a disability. My first thought after becoming a workshop floor supervisor was, “where were individuals with disabilities in my home community?” Over the years, I learned that in Bedford where I grew up all when to a segregated school. It always made me angry to think how I and others in my generation did not have the advantage of knowing such a great group of people and how they were considered “too special” to be in my school. After that first few months working at the workshop, I knew this was what I wanted to do. For the next 30 plus years I have had many jobs in the business, a work activity supervisor, a vocational evaluator, a job developer, a director of adult services, a consultant and finally came to LIFEDesigns (then called Options) in 1998. But working in direct service for 12 years was the best and it shaped my values in each successive position; reminding me daily why we are here. I came LIFEDesigns (then Options) in 2007. I had always wanted to do something where I could help people. I was a DSP for 3 yrs and I LOVED my job!!! I worked with a customer who had very high aggression and had a hard time working with staff. But I knew I could manage, so I took the job. And I LOVED it! I worked Direct Service for 3 yrs. The only reason I moved into the office was that I had to have some work done on my foot and had to be off my feet after that. Since I still wanted to work in this field, I came to the office to do something where I was not on my feet. I became the Office Manager. Really the best part of being the Office Manager is that I get to see the customers every day when they come to the building. I also get to work every now and then back in the field. I LOVE MY JOB. It is very rewarding to see all our customers smiling for the little things. This is what it’s all about. Each person deserves to be treated equally and made to feel like they belong. It’s also about getting customers involved in the community, and that’s what LIFEDesigns does. This is why I LOVE this company and I LOVE MY JOB!!!!!!!!!!! I started as a DSP at LIFEDesigns (then called Christole) in 2003 because I wanted to work with people with Autism. I thought the experience would help me in my career as a teacher. I was hired as a part time summer staff and had intended to only stay the summer. We opened a group home that year and I was able to help be a part of a team that transitioned six young boys into a new home. What an experience! My job was to help them feel safe in a new environment, have fun, and learn new things (not limited to a classroom setting). As a DSP, I was able to provide input to build effective plans and structure for these boys. I learned a great deal about working with others, communicating effectively, and other management strategies. Direct service is where all of my fond memories come from relating to work. Every day was a different day with challenges, successes, and learning experiences. I have a degree in Art Education, and taught Middle School in Battle Creek, MI for 3 years. When I moved back to Bloomington I needed a job and so attended a substitute teacher meeting for MCCSC. A woman came into the meeting and said she was looking for people to work full-time with students with disabilities in a program called Community Transitions. I said “Full TIME! Sign me up!” I think a lot of people start off in this field because they need a job. I learned so much in that first school year! When summer came I was looking for a job again and my co-worker told me about LIFEDesigns (then called Options). I was hired on as an Employee Development Manager, which at the time was a shared position with my talented predecessor, Jennifer Howlett. At first I though “Oh, crap! Someone is going to figure out that I don’t really know what I’m doing!” But with Jennifer’s guidance and cooperation I realized I really had a lot to draw on from my first year. Since the Employee Development Manager position was part time I was able to work Direct Service and create a full time schedule. This gave me more experience to draw from when teaching staff about supporting people with disabilities. One of Suzi Rinne’s (LIFEDesigns CEO) quotes to new employees is “You are both a teacher and a student”. It’s so true! Working with anyone who is different from you makes you appreciate uniqueness, realize the variety of life, explore the possibilities! Growing up in Bloomington I thought I knew this town pretty well. But doing direct service gave me the opportunities to explore new places and experience activities I might never have had otherwise. I am grateful to work for an agency that gives me those opportunities for personal growth and a sense of importance in what I do. I began working for Options in 2005 and was part of the merger with Christole to create LIFEDesigns in 2012- its been 8 years now! I’ve trained hundreds of staff in how to support people with disabilities to lead more self directed lives through education, employment, and community involvement. I feel I do a public service in educating everyone who comes and goes in the recognition of people with disabilities as valued, capable and contributing members of our community. What I do is important- and that makes me feel good! When I left and my lines were done I walked over to the pharmacist and said, ‘If I ever decide to leave the world of pharmacy I think I would really enjoy working with people with disabilities.’ She said, ‘Really?’ I said ‘Yes, what a rewarding job that would be.’ She said, ‘You would be great at that.’ So here I am, 6 years later, doing what I said I would like to do. When I think of that day and think what I am doing now, I can’t help but smile. I’m so happy to be a part of this team and play such a meaningful role in the lives of our customers. I am happy…I look forward to each and every day. I am thrilled to have the pleasure to help them become the absolute best of what they can be. Working with people with disabilities helps me to be patient. I’m by nature, hyper. But when I’m working with people with disabilities they make me patient and that in turn makes me have patience with them. Our customers turn me into an all around better person. I hope I can give back to them as much as what they give to me which is priceless. WATCH FOR MORE STORIES TO BE POSTED EACH MONTH! Want to LOVE YOU JOB, too? Join our team! Check out our CAREERS page for more info and to apply. THANK YOU to everyone who sent in responses. 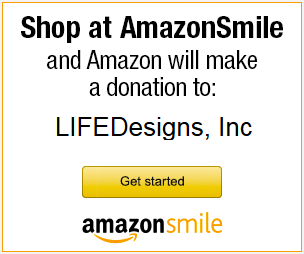 Without your wonderful dedication and care, LIFEDesigns would not be a success. You love your job and we love our employees! If you work at LIFEDesigns as a DSP and want to submit a story about why you LOVE YOUR JOB, please contact Leslie Abshier, Community Development Officer, at labshier (at) lifedesignsinc.org or Marianne Stemm, Human Resource Director, at mstemm (at) lifedesignsinc.org to share your story. I was born to do this job. My half-brother was born when I had just turned 4 years old. He was also born with Downs Syndrome. At age 2 he had a very high fever (107) and as a result has brain damage too. I loved helping my mom take care of him and at age 12 she divorced his father and became a single mother of 3. I took over my brother’s care while she worked and socialized. I never resented not being able to go out with my friends because my brother was my world. Then when I gave birth to my second child, she was born with autism. Of course this was a big concern to me, but not because she would require extra care and attention. As soon as both of my children were in high school, I went to college and earned a bachelor’s degree in social science. I wanted to work with people who had disabilities because I am so comfortable working with this section of the population. I started out as a DSP at another company and now I look back as that being my “boot camp.” The reason I refer to it that way is because I actually lived with the customers 2 weeks out of each month. This was very difficult because I was a new bride and had two kids of my own at home. My new husband helped me and I was able to work there 11 months. I then came to work at Life Designs Inc. (called Options at that time). I was quickly promoted to Team Manager and I have been doing that job for 9 years now. I look at each family and customer as extended family and I totally enjoy working with them to get the most out of life that they possibly can. I can’t see myself doing anything else.